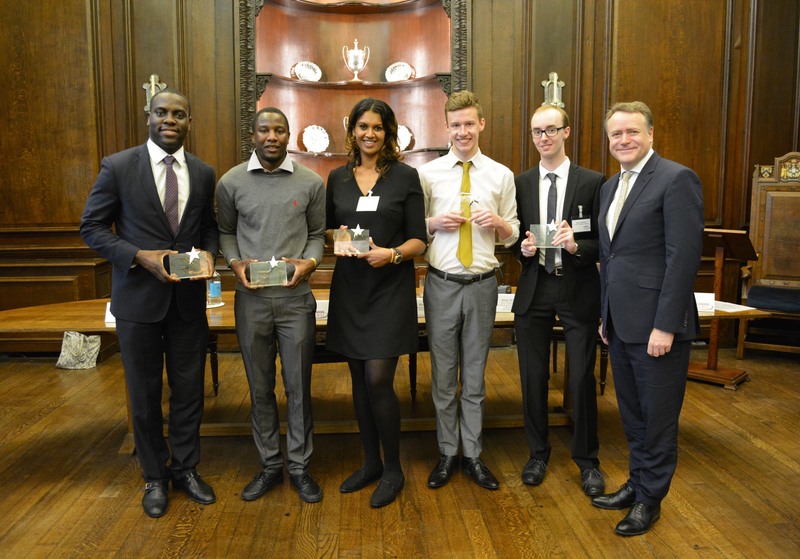 Winners of the 2016 Apprenticeship Awards have been announced! 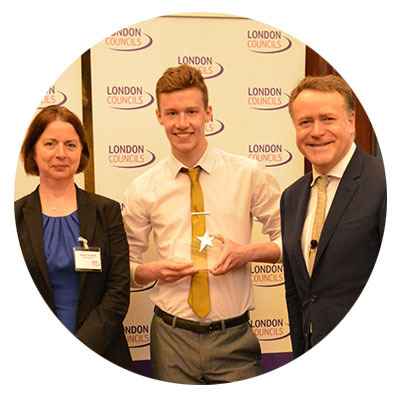 Apprentice of the Year 2016 - Ryan Emmerson A level 4 apprenticeship with Opportunity Sutton, the boroughs economic development team. Ryan began his journey with the borough in 2014 after completing his A Levels. He decided that university might not be the appropriate route for him and embarked on a career with the local authority. In the space of 2 years Ryan has progressed from a shy new employee to a confident invaluable member of the team with enough experience to take on line management responsibility. Ryan’s skills in project management and ICT meant that he was handpicked to deliver a series of corporate google events aimed at up skilling staff across the directorate. His ability and support has become a significant factor in the team’s excellent reputation corporately and with external partners. His enthusiasm to share his positive experience of apprenticeships with others is infectious and he regularly speaks at local school events. The judges chose this entry because it displayed both personal progression, in terms of confidence, skills and responsibility as well as evidence of significant added value to the team and council. Ryan is also a passionate ambassador for apprentices. The judges were particularly impressed with the high profile events and speaking engagements Ryan had delivered. Best contribution by a new apprentice - Tom Torode-Sims A Level 3 apprentice in the Waste and Recycling Team at the London Borough of Bexley. Tom supported the introduction of charging residents to have their garden waste collected. Tom made exceptional contributions to the scheme, his team and the partners he was working with. Tom’s passion for the scheme, methodical approach and amazing customer service skills had a positive impact and supported the original target of 10,000 sign ups to increase to 33,000 which generated income for the council. Tom has also volunteered as an ambassador with the borough’s young enterprise scheme; supported local apprenticeship events, mentored work experience pupils; shadowed a Deputy Director during Learning at work week and was on the interview panel to recruit a Director of Children’s Social Care. Tom was chosen because of his ability to use his initiative to make a number of substantial and significant changes to a service – resulting in improvements for council workers and residents. The judges were impressed with these exceptional contributions as well as the Tom’s activities as an ambassador. Highly Commended - Charlene Frielander, a Business Administration Apprentice in Tower Hamlets Parks and Open spaces department. Best progression by an apprentice - Shane Elliot Shane works as an apprentice in the Voids Team for the Regeneration and Housing department at the London borough of Ealing. Shane completed his Level 2 apprenticeship and has progressed to his Level 3 with the same team. Shane has the difficult job of getting tenants to pay to put right damage they have caused in their properties. Shane’s excellent customer service abilities and calm manner has meant that he has collected £37,000 in recharges for the borough. This income benefits residents as it is recycled into the repairs budget. In addition Shane designed a more effective process for collecting recharges making the service more fair, quick and consistent. Shane is a proactive apprentice ambassador and will be a peer mentor for the team’s new apprentice. Shane was chosen as the winner of this category because of his ability to add value to a difficult and highly pressured job. The judges were also impressed by the improvements Shane made to the service and value added to the team in such a short time. 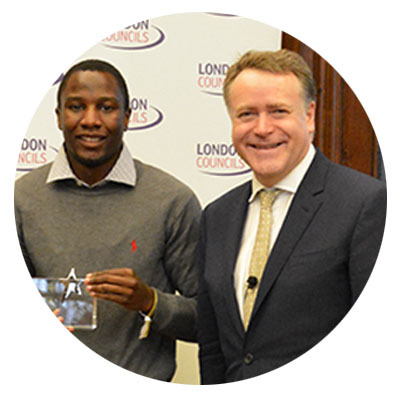 Highly Commended - Mitchell Hayzen, a business administration apprentice for the Royal Borough of Greenwich’s job brokerage service. 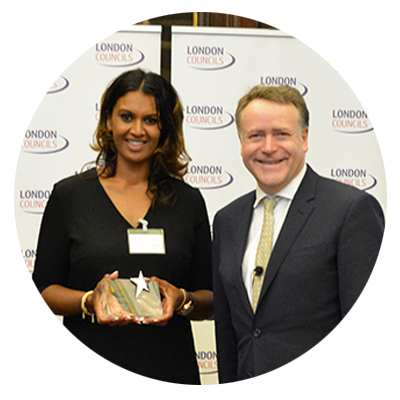 Best manager or mentor - Davina Pandya Davina heads the Joint Commissioning Team at the London Borough of Hounslow.. Despite increasing demands on the team, Davina works tirelessly to support her apprentice Rebecca. Davina provides a supportive yet challenging management style and has pushed Rebecca to develop new skills, leading to Rebecca having the confidence to take the lead on projects. Rebecca says ‘Davina is the best manager an apprentice could ever want – from the day I started, she has been supportive and kind towards me. Davina has opened so many doors for me and given me opportunities like no other. She allows me to show my creativity when planning events, giving me the confidence to believe in my ideas and more importantly myself’. This is made all the more impressive as Davina has not previously managed an apprentice. In addition, Davina used National Apprenticeship Week to speak to managers about the benefits of taking on an Apprentice. This led to an increase in the number of apprentices in the council. Davina was selected because the judges felt she offered an excellent management style – both challenging and supporting the apprentice. They felt the progression displayed by the apprentice demonstrated the value of Davina’s excellent and intensive work. In addition the judges were impressed with the promotion of apprenticeships within and beyond the council. Southwark champions apprenticeships during procurement to build targets into key council contracts. Last year contractors took on 92 new apprentices across administration, IT, customer support and technical roles. The borough’s employment programmes created 52 more with local employers and partners. And through S106 commitments 107 apprentices started in construction. The Southwark Apprenticeship Standard continues to set the standard for quality local apprenticeships with employers like PWC, the GLA, Essentia and smaller employers too. In November the borough celebrated 23 signatories to the Standard; these partners created over 100 apprenticeships last year, offering the best in secure employment, a fair wage, apprentice support and quality training to their apprentices. Southwark’s borough-wide approach focuses on sustained impact. Building on 412 apprenticeships across some 60 employers, this year the borough is ramping up apprenticeship promotion with a two year campaign in partnership with schools and colleges. 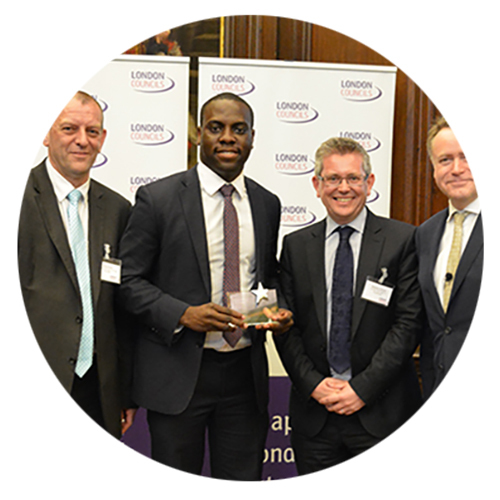 The judges selected Southwark due to the innovative work they have undertaken to increase both the quantity and the quality of apprenticeships. The judges felt Southwark is forward looking and always trying to generate new, high quality, opportunities for local residents.